What to expect after filing Income Tax Return? Most people would have filed their Income Tax Return (ITR) by now. But do you know your tryst with ITR does not end with here. 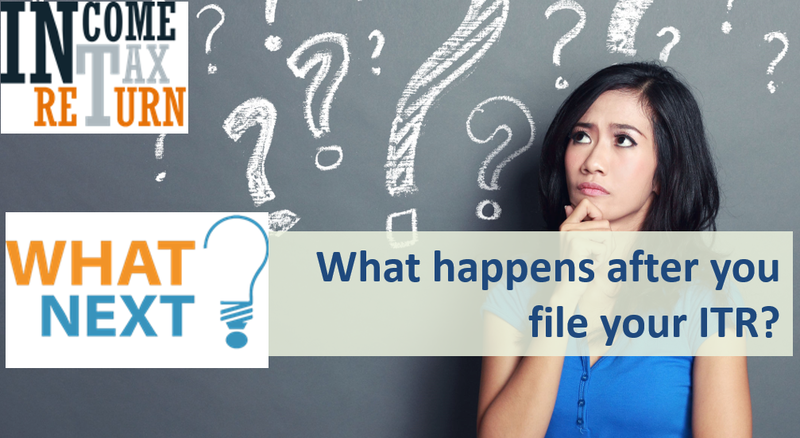 This post we discuss what awaits you after you have filed your tax returns? As stated above in the first case, everything looks good and so no action is required from your end. In second case if you agree to the IT department calculation pay the additional tax. In third case think how to spend/invest additional tax refund! Also Read: What does Intimation U/S 143(1) of Income Tax Act mean? The mismatch is generally due to incorrect claims, numerical errors, excessive or wrong deductions or exemptions. What if you Do NOT Agree to Tax Calculations? In case you do not agree to the income tax department you can file a rectification application u/s 154 challenging the computation. If the ITR was filed online, the rectification request would also be filed online. For offline ITR, the request would be offline. This rectification request can be filed up to four years from the end of the financial year in which the assessment order was passed. For online rectification request login to the ITR portal. Go to My Account choose ‘Rectification Request’. Enter the CPC reference number and order date from the intimation letter and then your clarification. The assessing officer has to either accept or reject the request within 6 months from the month application was filed. In case the rectification is rejected, you can appeal to Commissioner of Income Tax (Appeal) u/s 246A(1)(a). Also Read: Tax Notices You can get and What to do about it? In case of tax refunds, the excess tax is credited within 2-3 months of filing ITR. In case you do not receive your refund you can track it online either on the tax department’s website or at the National Securities Depository Ltd. (NSDL) site. Usually the refund is delayed due to wrong information of bank account or other data entry issue. The status would give you the reason for delay. If the refund was issued but has not reached you due to any reason you can raise a request for it to be re-issued online through the ITR website – ‘My Account’ tab. If you notice any discrepancy or omission on the return filed before it’s processed by IT department, you can file a revised return u/s 139(5). The revised return has to be filed online if the original return was filed online. Similarly if the original returned was filed physically, the revised return has to be filed physically. You should revise your ITR as soon as you find discrepancy as you would not be able to do so after IT department process your returns. Also Read: Why and How to Revise Your Tax Return? You need not give any supporting documents while filing your income tax return. But the department can ask for supporting documents used to claim your income, tax deductions and exemptions etc anytime for the next seven years. Documents for all high value transactions (either sale or purchase) like gold, property and other precious items. The above list is to give you example and not exhaustive. In all the process if you have any grievances, you can register it online. You can then check status of your complaint online. Why and How to Revise Your Tax Return?